NASA’s InSight spacecraft will make its final approach today and attempt to pull off one of the greatest engineering feats ever accomplished: landing on Mars . If successful, the landing will be the first touchdown on Mars since 2012, when the Curiosity rover arrived on the planet and began its study of Mars’ geologic history and potential for past or present life. And thanks to two little spacecraft flying along with InSight, the Mars Cube One (MarCO) satellites, you can follow along in real time with NASA as the space agency tracks InSight all the way down to the rocky red surface of Mars. The craft will land in the same manner as the Viking spacecraft before it, using the friction of a heat shield and then a parachute to slow down from hypersonic speeds as much as possible with atmospheric drag. Then, still traveling about 180 miles per hour, the lander will fire retrorockets to bring it down for a soft landing. This entire process needs to occur autonomously, as NASA cannot steer or otherwise control the spacecraft as it descends. 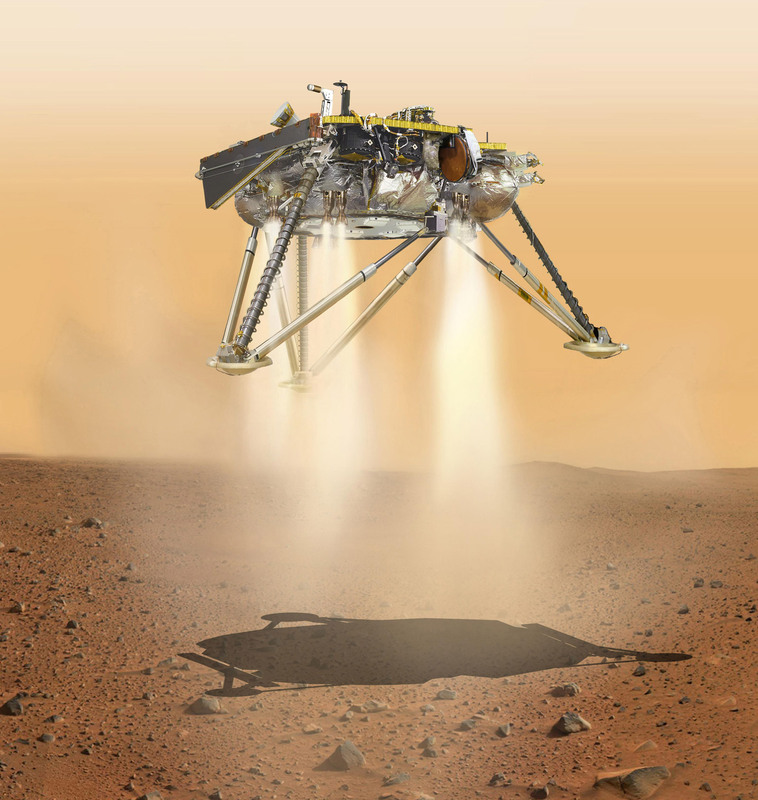 The landing should occur just before 3 p.m. EST, and shortly after, InSight is scheduled to send two landing confirmation signals seven minutes apart, indicating that it has touched down safe and sound. If these signals are not received, all is not necessarily lost. The craft could encounter an unexpected complication on the way down and enter a safe mode, which would delay a landing confirmation signal. In such a case, NASA would work to establish communication with the spacecraft via the Deep Space Network of radio dishes around the world, and also attempt to photograph the landing site with one of the orbiters already circling Mars. Unlike its roving companions, InSight will not be directly searching for signs of life on Mars. Instead, the craft will operate two primary science instruments: the most sensitive seismometer to ever leave Earth and a heat probe designed to burrow deep underground. The Seismic Experiment for Interior Structure (SEIS) can detect ground vibrations that are smaller than a hydrogen atom, providing an unprecedented picture of the tectonic activity and geologic shifting of Mars. And in addition to “Marsquakes,” the instrument is expected to pick up vibrations from meteorite impacts, volcanic activity, and even possibly the rush of subterranean flowing water. The Heat Flow and Physical Properties Probe (HP 3 ) will compliment SEIS, using a self-hammering device to burrow down to a planned five meters below the surface—deeper than any digging on Mars before. The probe will detect how much heat energy is flowing out of the planet, and where the heat is coming from, expanding our knowledge of how the planet formed and evolved. The mission may seem specialized, but these two pieces of information—seismic activity and heat energy—can tell scientists a great deal about the history of Mars. This afternoon, the most interesting thing going on on Mars will be a human-made spacecraft coming in to land in the flat desert plains of Elysium Planitia, near the Martian equator. And thanks to MarCO, the first CubeSats sent to another planet, you can follow along live with NASA.